As the #MeToo and Time’s Up movement marches steadily on, far more attention is being put on the sleazy behaviour of powerful Hollywood figures abusing their power for disturbing rewards, and so far it’s dug up some pretty vile secrets buried from certain individuals’ pasts. However, there’s one figure with notoriously inappropriate behaviour who is not only still working, but is also someone that people continue to be a bit uncertain about. Woody Allen’s alleged abuse towards adoptive daughter Dylan Farrow is public knowledge at this point, to a point where the scandal even has its own Wikipedia page, and yet while other figures like Harvey Weinstein and Kevin Spacey have gone down as a result of the movement, Allen has yet to have his past catch up to him like the others, something that Farrow has openly expressed in interviews following Weinstein’s downfall. Not that it hasn’t had some effect on Allen’s credibility, with several actors publically expressing regret over having worked with him in the past, and a few others like Timothée Chalamet and Elle Fanning announcing they will be donating their salary for working on his next movie to charity, but I have a feeling that even if the allegations hadn’t recently come back into the spotlight, and most of Hollywood was against him in a sensitive time where abuse is finally being stomped out by the victims, I would still be comfortable in saying that his latest release Wonder Wheel is a rather rubbish waste of time, ranking amongst his weakest filmmaking in years. 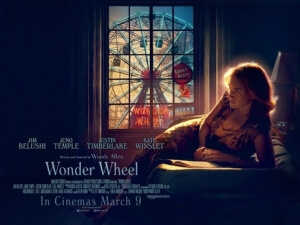 It’s set on Coney Island during a summer in the 1950s, when a young woman named Carolina (Juno Temple) arrives at the small apartment of her father, carousel operator Humpty (Jim Belushi) and his second wife, former actress Ginny (Kate Winslet), seeking a hiding place from her mobster husband, who is looking for her after she disclosed information of mob activity to the FBI. They take her in, but it’s not long before Ginny’s insecurities cause her to slowly but surely grow jealous of her attraction to life guard and aspiring playwright Mickey (Justin Timberlake) – largely because she herself is embroiled in an affair with him. It’s important to note that Timberlake’s character wants to be a playwright, specifically like Eugene O’Neill, because it ties into the fundamental flaw that nearly everything about this film, from the dialogue to the production design to the cinematography to even the acting, looks and feels like it’s a stage play. It’s likely that it was Allen’s intention to thematically and conceptually represent an O’Neill play when he wrote this particular script, but if that was the case then he really should have recognised the vast difference between stage and film. This is the kind of script that includes lengthy monologues and duologues, minimal sets, characters breaking the fourth wall to narrate things to the audience, and heavy exposition on scenes and characters that are told to us instead of shown; all of these things would be absolutely fine if this were all performed live on, say, the National Theatre stage, but as a film, which is far more of a visual medium and shouldn’t be so dependent on exposition in the first place, it’s incredibly clunky and misdirected. You keep picturing in your head as you watch it how this might have been a somewhat passable stage production had it been allowed to blossom as an actual play, instead of the messy and structurally inept movie that it is. Although, it’s likely that even if Allen intended this as a play, it would still not be anywhere close to his finest work. It’s a rather weak story, one that’s filled with increasingly unsympathetic characters and dialogue that’s a little too on the nose, with a lot of it being just exposition about things we should really be privy to regardless of what medium it’s being performed in. Needless to say, it doesn’t even compare with some of Allen’s more intellectual and imaginative projects in the past, and you just end up not caring at all about what happens to these people by the time it all finishes, because nothing about it particularly grabs you as being in any way interesting or compelling. As a script, no matter where it ended up, either onstage or on-screen, it’s a damp squid that if anything shows signs of frailty in this creative but incredibly warped mind of his. This isn’t even a fine piece of filmmaking, as the claustrophobic sets really prevent any interesting camera angles from standing out, with some scenes being mostly done in one take which just looks like – again – we’re watching a live broadcast of a stage play. Some of the cinematography can be nice, but a lot of it is made up of blindingly bright lights of red, blue and other distracting colours that cast more of a shadow on things than it probably intended to. As for the four main cast members, only half of them – Winslet and Temple, specifically – give meaningful and strong performances; Belushi is awful in this, grunting his way through this film whilst sounding like Fred Flintstone with brain damage, while Timberlake is wildly miscast in a role that requires him to be fairly charming, but because he’s not that powerful of an actor sometimes his lines come out rather stilted and noticeably wooden for him to actually achieve some level of charisma. Whether or not the Time’s Up movement will finally blot out Allen’s influence on Hollywood thanks to his predatory behaviour is yet to be seen, but if Wonder Wheel is any indication, then his fading creative genius will get him way before the movement will. Wonder Wheel is one of Woody Allen’s least impressive films in years, with a script that feels like it would be better performed on stage instead of on film, and some of the weakest and underwhelming filmmaking of his later career.